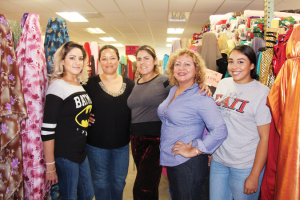 Rainbow Fabrics team members Jocelyn Nunez, Imelda Medina, Kimberly Nunez, Roselia Nunez and Jessica Estrada have worked together to make Rainbow Fabrics’ new location a success. Longtime downtown business Rainbow Fabrics has packed up shop and moved just down the road into the Turlock Town Center where already, it feels like home. Rainbow Fabrics is a one-stop shop for the community’s fabric needs, with a vast selection of different materials perfect for big sewing jobs and a talented team of seamstresses ready to make any repair or alteration. The fabric store called numerous locations on West Main Street in downtown Turlock home over the past 20 years, residing first at 134 W. Main St. and then moving to the Mercantile Mall just down the road. From there, Rainbow Fabrics moved to 108 W. Main St. before landing at their previous spot, 100 W. Main St., where they thrived for about seven years. The parking situation for the shop’s customers was less-than-ideal, however, so Nunez decided it was time to look for a new location as soon as her lease was up. Now, Rainbow Fabrics has moved into 663 and 665 N. Golden State Boulevard, next to neighbors like Rite Aid, Big 5 Sporting Goods and dd’s Discounts. While the large parking lot is just one benefit of the store’s new spot, the surrounding shopping center has drawn new customers to Rainbow Fabrics, said Nunez. At the store’s new location, loyal customers have followed Rainbow Fabrics. Combined with the shop’s newest customers, business is doing well, said Nunez, but she hopes to see it increase in the coming weeks.